There will be no full blown global RV until there is Middle East Peace, which must include both Israel and Palestine acknowledging the others right to exist, and dual sovereign state adoption of the recent United Nations Security Council's side by side, living in peace two state resolution. Until this occurs, we will continue to be made to wait for individual exchanges. All must go or none go. Period. But keep looking at Mosul if you want Dinarland because the rub of the RV lies in is Jerusalem. More accurately, specific parcels of land being returned to the Palestinians, primarily the Old City of Jerusalem by the Zionists that currently run the Israeli Knesset. Palestine is demanding that the Old City be placed back under Arab control; Netanyahu is demanding it remain under Zion control even though most Hebrews desire peace and are willing to accept some form of a two state solution. The problem is BiBi has no more leverage to negotiate from other than the chaos he self-manufactures. Because the rest of the world isn't buying his schtick anymore. No more fear of the cabal capital. The Chinese Elders are demanding the issue be completely resolved before their new global financial system releases untold wealth into the entire region--for Hebrews and Muslims alike. So Netanyahu is using all his old pro-Israel propaganda tactics to frame the argument on the global media stage, as he fundamentally believes Jerusalem is the spiritual property of Zion, forget the fact that Jerusalem was under Palestinian control for over 2,000 years before 1967. Israel as a nation state didn't even exist until 1948. BiBi is now using Trump to assist in framing his side of the argument only, which is the only reason Trump was summoned to asset in the region this week (Trump was in Saudi Arabia on Sunday; Israel on Monday and Palestine today). Palestine's public face, President Abbas, is simply allowing the world community to leverage their combined political, diplomatic, military and financial strengths against Netanyahu on behalf of the long impoverished Palestinian people--which are representative of the way the entire Arab world feels about Israel being in the region. But King Hussein of Jordan is actually the leader of a new Palestine Authority, as Jordan once ran Palestine before millions of displaced European Jews immigrated to Palestine post WW1 & WW2. In reality, things are going back to the way they were with a small Hebrew nation state wedged between the Mediterranean Sea and Syria. Peace is mercifully being achieved, all be it painstaking slow, through the elimination of all radical elements of both Muslim and Zion religions. Even the majority religion, Hebrew, is being held hostage in Israel by Netanyahu's radical far right Zionist political party called Likud. This process of political elimination is what we have been witnessing for several years and decades. And the prayer of all prayers is that peace quickly be achieved in the region so the world can receive its heavenly blessing. Well, the RV is a globally significant enough event to force all the players into peaceful, long-term political positions because no nation or people wants to be left out of the financial windfall that's fast approaching from Asia. Both existing governments have been quietly replaced to create a more lasting political environment for sustained peace, less the past century of hostilities. 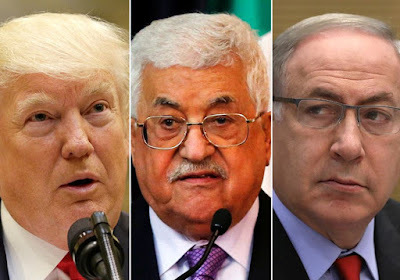 So in truth, neither Netanyahu nor Abbas really will be around once the Middle East Peace solution is announced because both were part of the problem. And the real reason Trump likes to say both sides are closer than ever to a deal has nothing to do with his ability to negotiate, it has everything to do with neither side wanting to be left out of the RV, plus also allow the other guy to get credit for Middle East Peace historically. And because the world community sides in majority with Palestine and Abbas, Netanyahu and Zion are just isolated relics of an ideology recently announced as deceased by the Chinese. Both Netanyahu and Abbas must put aside their deep differences to settle the matter before it's settled for them by the world community--which structurally and legally are in position to implement international authority. The deeper irony here is that Trump of all people will attempt to take credit for solving this once seemingly unsolvable problem. And no credit will go to the Chinese Elders--just the way they like it. Talk about living through a nightmare to reap the rapture. Believe it, don't believe it... either way you're right.